In the early 1900's it was common practice to use lead plumbing. Since the 1930's, copper pipe has been used for residential and commercial plumbing. Until 1986, however, copper pipes were joined or repaired with lead based solder. Lead is a soft metal and will leach into drinking water. As any other heavy metal, if consumed, lead will concentrate in our bodies. Lead is known to cause serious damage to the brain, kidneys, nervous system and red blood cells. The greatest risk, even with short-term exposure, is to young children and pregnant women. The Aquathin Lead Out Filter is structured to reduce the lead concentration far below the E.P.A. recommended level of acceptance. The lead Out Filter also contains a secondary media for continued reduction of sediment, chlorine and organic contaminates. 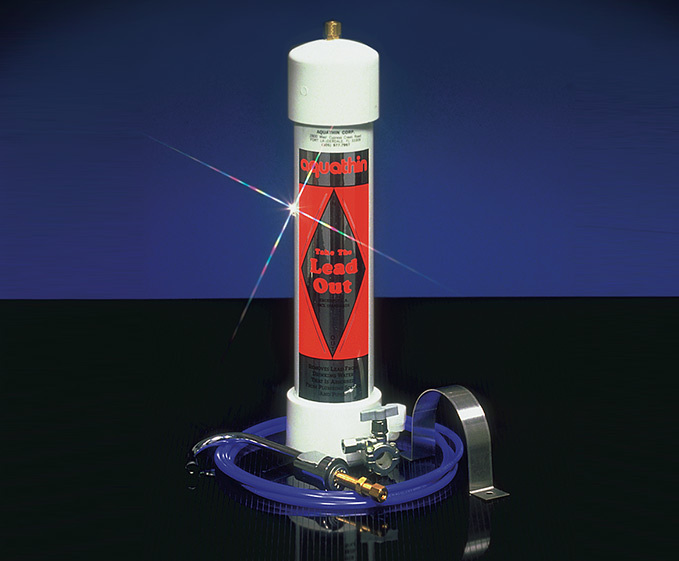 Please click the Product Catalog button below for more information on Aquathin's Lead Out Filter.